Family-owned oyster bar never disappoints. 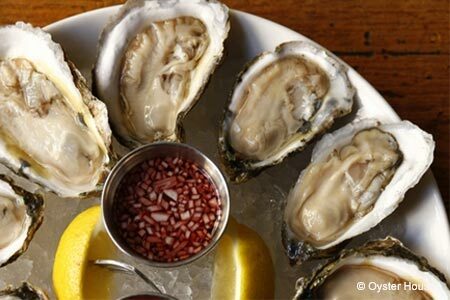 : With third-generation restaurateur Sam Mink at the helm, the reconceived Oyster House offers a different bar configuration, a large central raw bar, and a menu of fresh seafood with offerings of raw clams and oysters as well as house specialties such as a lobster roll. Expect to wait for a seat in front of the shuckers; this place is always busy. Entrées include pan-seared cod over fried polenta with broccoli rabe and bagna cauda; fisherman’s stew with saffron rouille; and, for the landlubbers, an Oyster House Prime dry-aged burger topped with a fried oyster, blue cheese and grilled onions. Craft beers and wines by the glass complement the top-of-the-catch fare. Ask about oyster shooters --- they're a specialty of the house. Stop by for Oyster Hour, a buck a shuck, Monday to Friday 5 p.m.to 7 p.m. and Saturday 9 p.m. to 11 p.m.